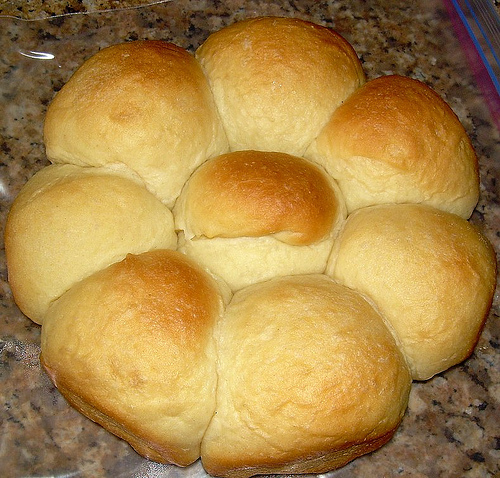 Golden Pull-Apart Butter Buns. Don’t those sound fantastic? They didn’t turn out quite like I had hoped, but I’m willing to give them another try. The good: the flavor was great, and my husband liked them. The bad: I didn’t get the flaky, pull apart texture that I was looking for – these turned out to be more dense and doughy than in the King Arthur Flour photo. I did par bake the rolls, meaning that I baked them until they set but did not brown, set them aside, then finished baking them off just before serving dinner. Next time, I’ll bake them all the way through and see if I get different results. If anyone has any ideas why I didn’t get fluffy rolls, drop me a comment. In the meantime, I’m sending this over to Susan at Wild Yeast blog for her weekly YeastSpotting roundup. Beautiful buns! I love the “buttery” part! Very lovely! I tried that par-bake and got similar results. Very interesting about the parbaking. I’ve never tried that. It seems like the recipe has enough liquid. I’m wondering if giving a longer rise to the rolls or maybe baking at a hotter temperature (like 375 or even 400) will give you fluffier rolls. Oh, those are great ideas, Laura! Thank you! Did you use potato flour or potato flakes? I suspect the flour would give a denser roll but I could be wrong. They do look lovely! Sorry to hear that the texture wasn’t what you were hoping for. They certainly look delicious. I haven’t tried that particular recipe, so no insights, unfortunately. I love a good dinner roll. They sound delicious. Those look awesome! Too bad you didn’t get the flaky texture, but I think they look great.